Two Wednesdays ago, I said I was starting a studio clean up. I haven’t made a lot of progress, but there are a few signs of hope. This was my work table 2 weeks ago. 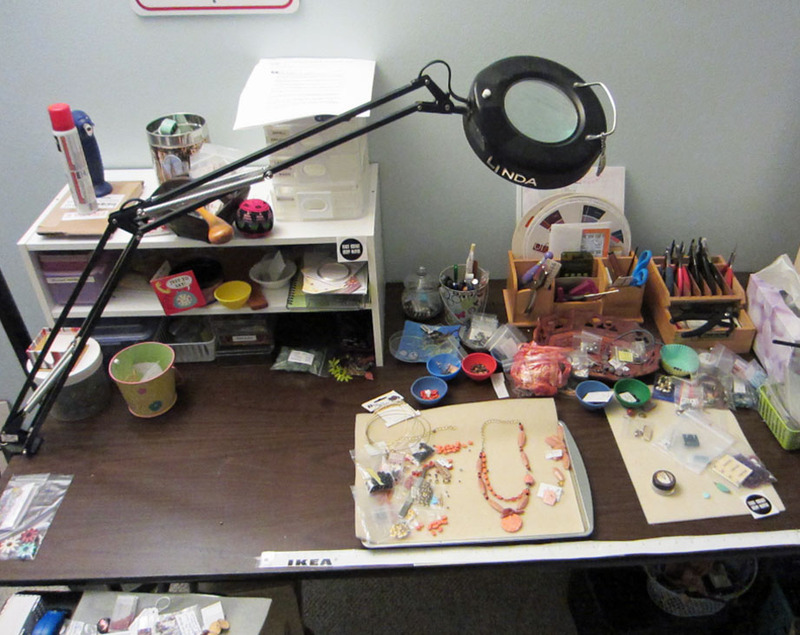 Close up of cluttered jewelry work table. It’s not a whole lot better, but if you look at the picture below, you’ll notice that there is a bit of clear space on the left. 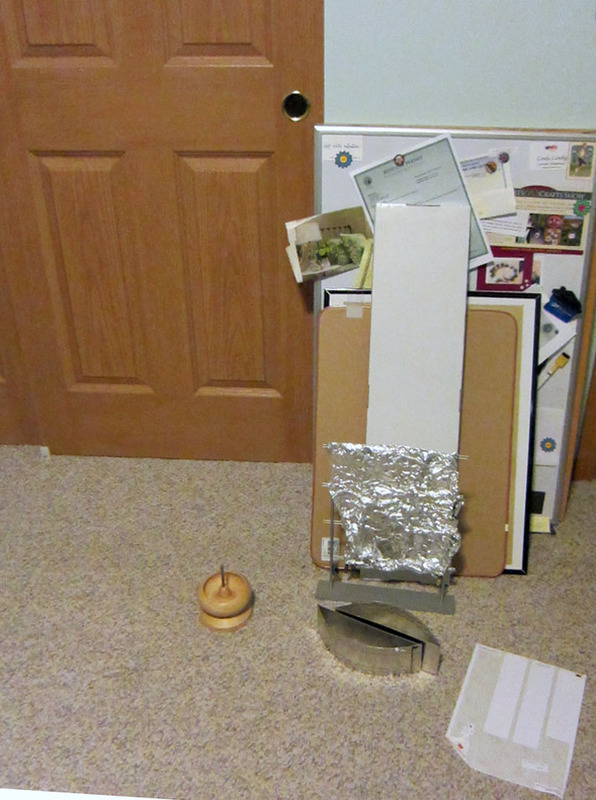 And although there are materials out and about, they are mostly related to the current project, and are not just random clutter. I am nearly done with this necklace. I decided I didn’t like the clasp I had made, so I removed it and still need to make a new one. I’m also going to remove one of the long calcite beads on the right, and instead, extend the chain a bit longer. Even though it is an asymmetrical design, there still needs to be a sense of balance. I think it will look more balanced with these revisions. 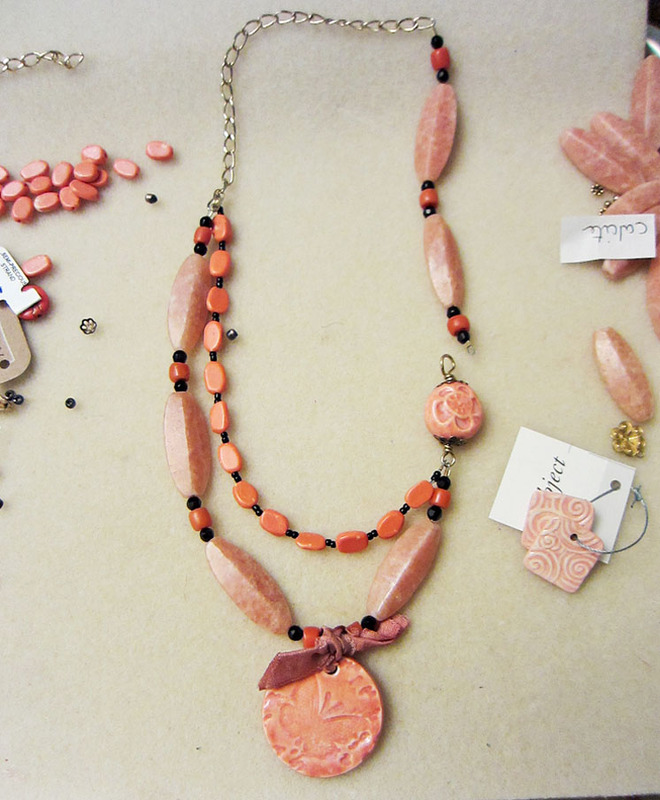 The butterfly pendant and flower bead were made by Yolanda’s Clay. The 2 little swirly ceramic squares on the bottom right were made by Marsha Neal Studio and they will eventually become earrings. This white board (see picture below) is no longer propped up on the floor. 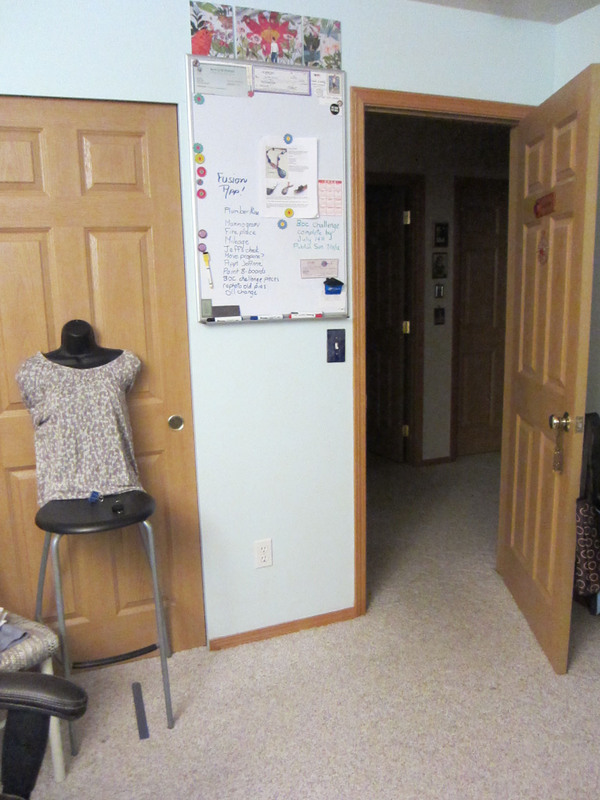 I put the bulletin boards in the closet, until I can paint them and I put away the other “junk”. Bulletin boards and white boards that need hanging up. Looks better, huh? I’ve got a running To-Do list up there, the due dates for the Beads Of Clay Challenge (I’m on the design team), a necklace idea and a magnetic calendar. The drawings above the whiteboard are by my brother, Jeff Kaufman. To the left you can see a new addition to my studio, This is Matilda II. Why the 2? My mother was quite artistic and she made a torso sculpture that we affectionately called Matilda. This mannequin is also just a torso and so she is Matilda the Second. It’s such a pleasure to have the white board hanging and functional now. As you can see, small things make me happy. What small things put a smile on your face? Visit the BTW Flickr group and see what others have on their bead tables. 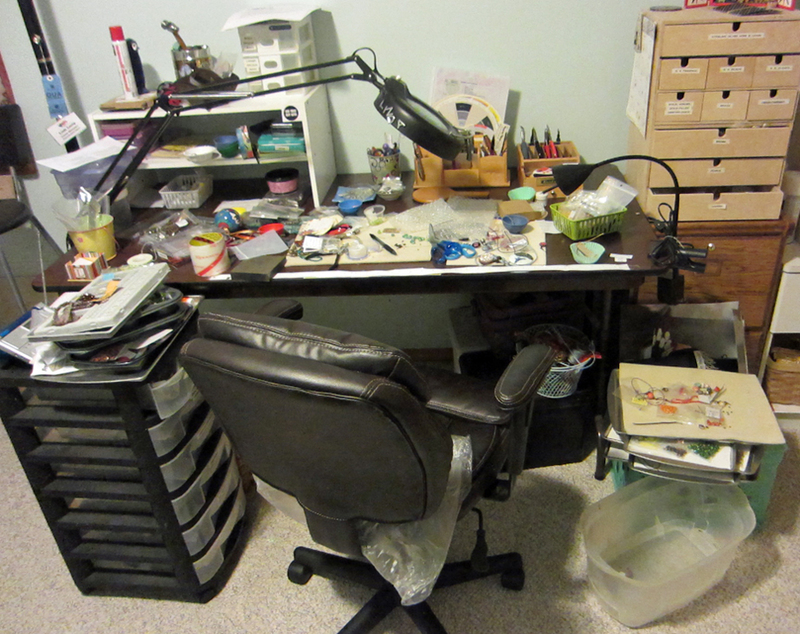 I have had 3 shows in the last month and my studio reflects the chaos that results from show preparations. 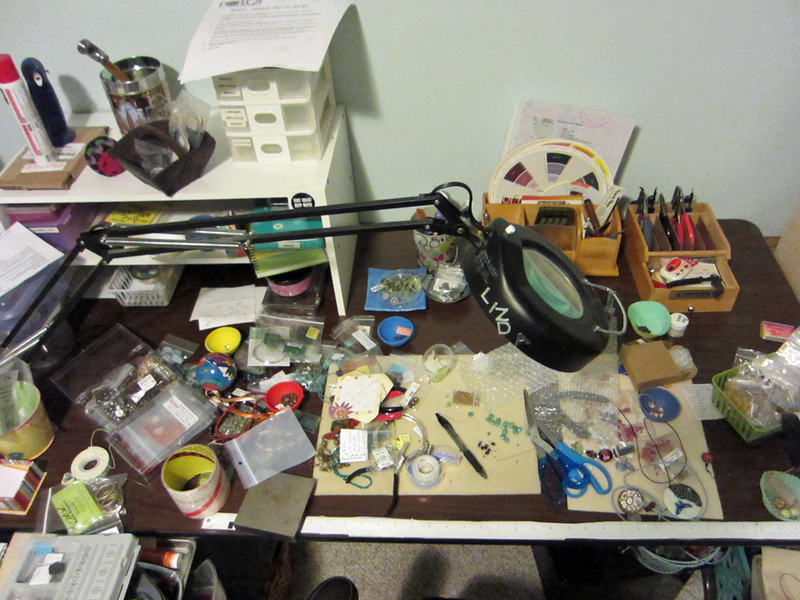 I’ve been making as much jewelry as possible, creating hang tags and earrings cards – but not cleaning up after myself. Now that my shows are over for a while, I need to focus inward a bit. 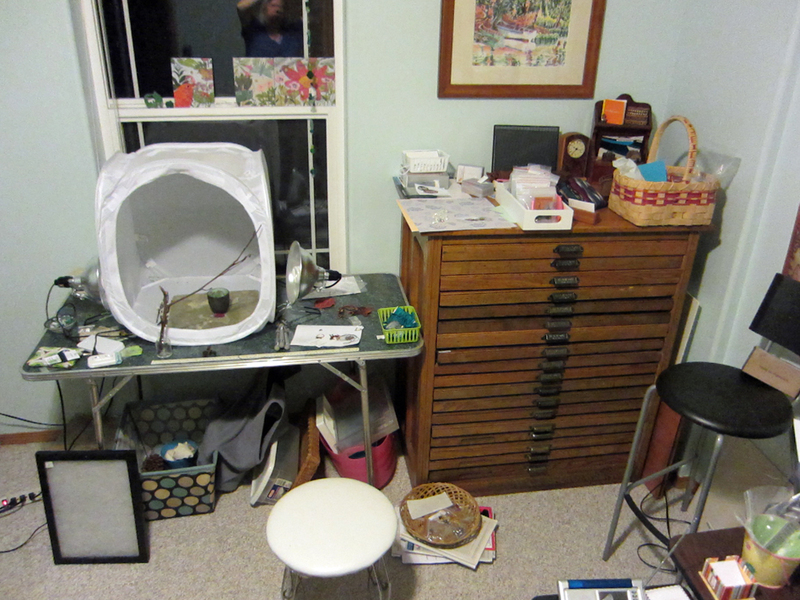 I’m posting pictures here of how my studio looks today, with the intent of holding myself accountable for showing you better organized results next week. Clutter on the bookshelves to the right of my computer table. 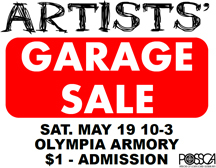 2 Saturdays ago, I was at the Olympia Artists’ Garage Sale. I sold not just jewelry, but also surplus supplies. I filled 2 plastic shoe boxes with beads I no longer wanted. I had sold about 2/3 of the beads, when a couple approached my booth and asked if I would sell all the remaining beads for $10! For sure! So that was the start of my spring cleaning efforts. I also sold some display items I no longer wanted. 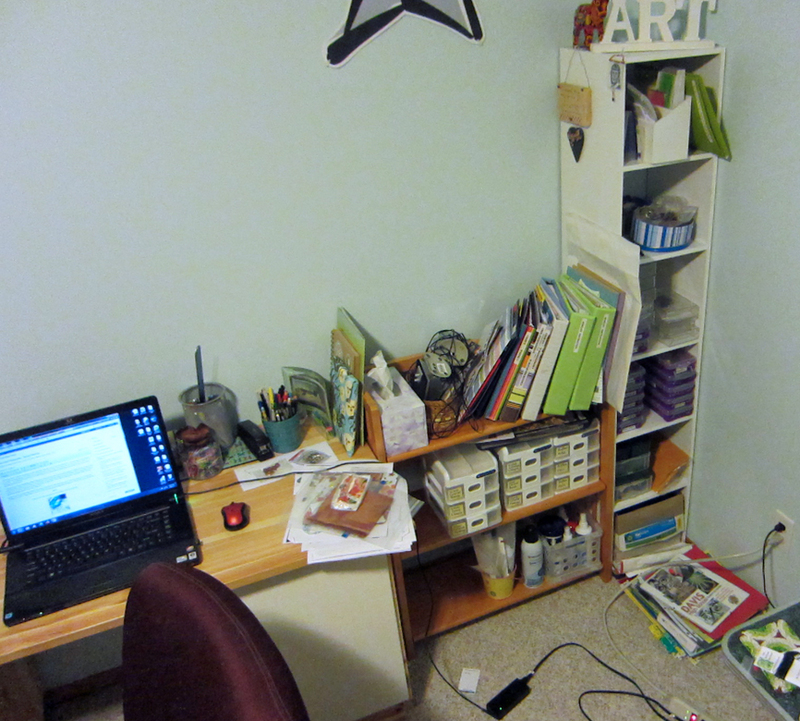 The more unneeded stuff I can clear out of this room, the better! I made a number of new earrings, bracelets and necklaces for my shows this month, but I haven’t listed them online yet. So along with cleaning up, I intend to list new jewelry. Be sure to follow my Linda Landig Jewelry Facebook page, as I will post all my shop updates there. The town I live in, Olympia, WA, is a pretty funky, artsy place. We have a fun, annual event called the Artists’ Garage Sale. Now this isn’t your ordinary, run-of-the-mill spring garage sale. Oh no! This is over 70 artists, gathered together and selling excess art supplies (canvas, tools, beads, instruments etc.) and lower priced art works. The booth fees and $1 entry fee goes to support and promote the arts and area young artists. This Saturday will be the third or fourth time I’ve done this sale. I will be selling some excess beads, (well maybe not some–it’s actually a lot), some booth display items and my handmade jewelry. I will be offering jewelry in a price range of $14 – $80. 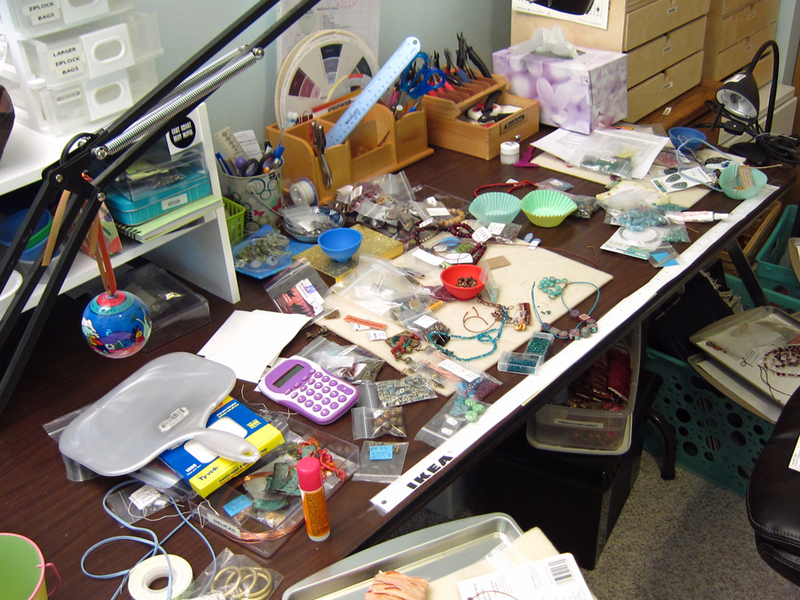 Right now my bead table looks like a wreck, but within that wreckage are efforts to create a large stock of lower priced earrings. 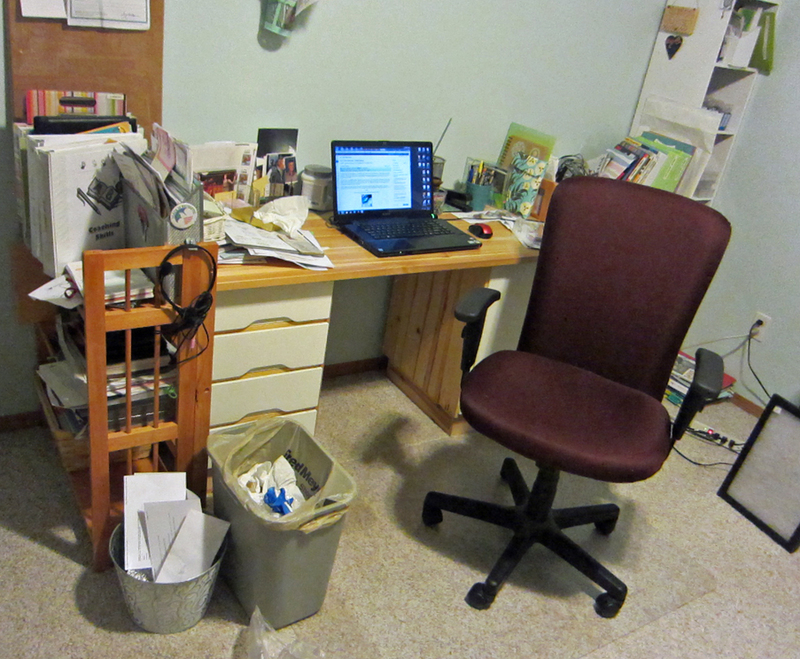 My work table–sigh….. I need an organization intervention! 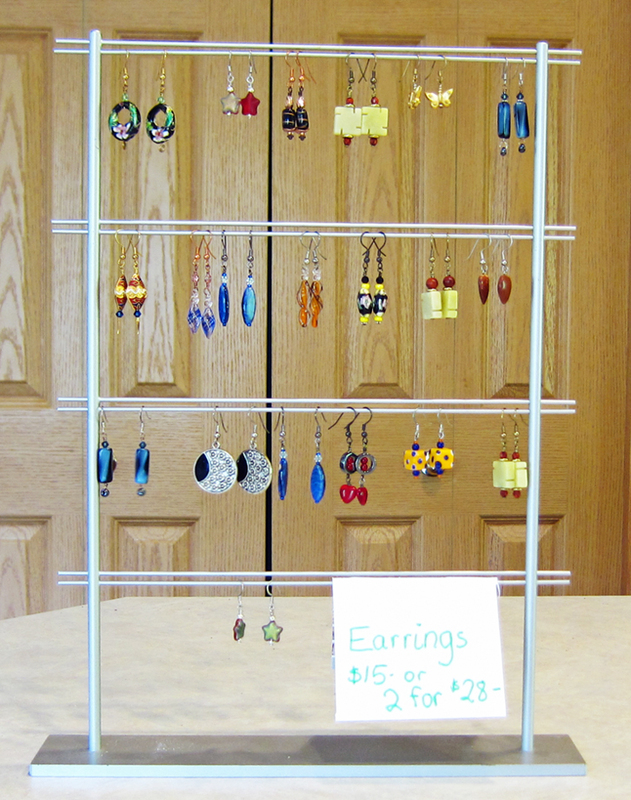 I’ve made these lower priced earrings so far. I will be offering them for $15 each or 2 for $28. 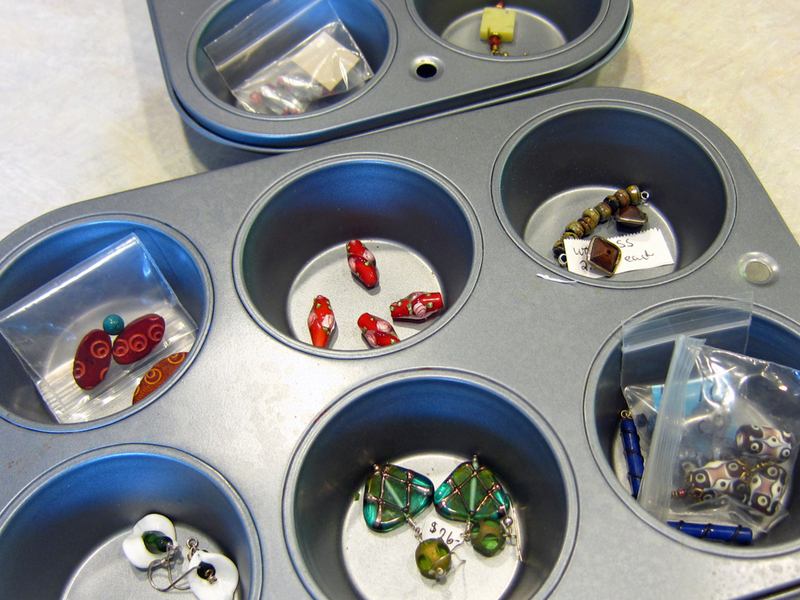 I’ve been making use of Heather Powers’ suggestion to use muffin tins to organize my projects. Each muffin space has the beads needed to create a pair of earrings. Whenever I have a bit of time, I can just pull out my muffin tin and set to work, with everything right at my fingertips. I blogged about this organizational tool here. After the Garage Sale, my friend Lee Anne French, and I are going out to dinner together. I’m really looking forward to getting a chance to visit. Lee Anne will have a booth at the sale too. She makes delightful, affordable jewelry, which you can find at Saturday’s Garage Sale or in her shop: Baubles Handcrafted Jewelry. If you are local, I hope you will stop by and say “Hello” at the Artists’ Garage Sale on Saturday!